Happy Birthday Wishes and Cards to Share on a Special Day! Cynics might say that celebrating an anniversary is a funny opportunity to remember the Earth’s rotation. 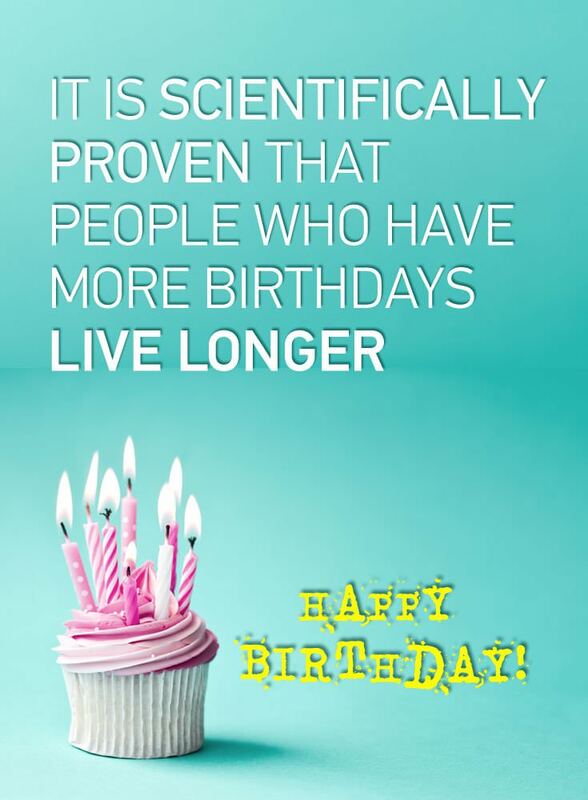 However, birthdays are so much more than this: every person’s birthday feels like a great chance to feel grateful for our existence and happy for the gift of life itself. This is a collection of beautiful words to tell, send to & share with a person you love and care about on their birthday. Feel free to use them anytime you won’t – they are our contribution to this celebration of the miracle of life. We hope you like them! Such a special day calls for a special party! Happy Birthday & enjoy yourself! Happy Birthday to the special person you are. You mean so much to me, stay around! I’d like to wish the Happiest of Birthdays to you and you only! Happy Birthday to a person I respect and care about. I’m happy we’ve got each other in life. Birthday Greetings from someone that wishes only the best for you! If this wish turns to a smile on your face, I’ll be even happier than now that I’m saying “Happy Birthday”! Another year older, another year wiser, one more year closer to your dreams coming true. Happy Birthday. Happy Birthday Wishes from someone that really loves you and cares for you! Wishing you a perfect birthday surrounded by those you love, doing what you love the most. Happy Birthday! A simple wish might not be enough to get the message of love across, but I have to say it: Happy Birthday! Two words can get the message of this day across perfectly: Happy Birthday! And, then again, three more will do: I love you. While every day of our lives is mainly about the pursuit of happiness, on this day you should care mainly about the pursuit of pleasure. Happy Birthday, buddy! No need to lie about your age if you look as beautiful and shining as you do. Happy Birthday! Youth is in the soul, not in the number of your years. Happy Birthday – stay forever young at heart. As years go by, I see love filling your heart and wisdom filling your soul. Stay on this great path! Happy Birthday! I hope this day makes you as happy as I am to have you by my side. Happy Birthday! May the future grant you the experience to value everything the past brought you. Wisdom & happiness – and a happy birthday! I hope your life is adorned with people that you love, just like a field is full of flowers. Happy Birthday! I’m not avoiding getting you a great present, but your inner beauty and your looks are the absolute gift. Happy Birthday & shine on! If what you see in the mirror is a lovely, giving and sincere person, we see the same thing. Happy Birthday, stay forever positive! I asked many of my friends what I should get you as a gift, but no answer could be compared to the gift that you are to me! Happy Birthday! Wishing you a perfect birthday surrounded by those you love, doing what you love the most. Happy Birthday. You are the sunshine of my life & your birthday is the ideal background for celebration. Happy Birthday, the time is now! I don’t know about last year, but this year’s age suits you just fine! Happy Birthday! Health, love and peace of mind is what my wish list for you has written on it. Happy Birthday! If there’s something you are dreaming of that is a new entry to last year’s wishes of mine to you, please let me know! Happy Birthday, today and always! On this special day of yours, let me wish “Happy Birthday” & hope these words will also help your dreams come true. Give us this permission to spoil you tonight as a minimum recognition of how much you spoil us during the rest of the year! Happy Birthday! You mean the world to me & this is your day. Happy Birthday & let’s make the most out of it together. We can’t forget what a great success the party for your 23rd birthday was. But trying to repeat it for the thousandth time is rather childish!… Wait: that probably means you are still pretty young after all! Happy Birthday!!! A spontaneous birthday party is much, much better than no birthday party at all. Happy Birthday improvisations! Someone really special to me was born on this day some time ago, and that’s definitely a reason to celebrate! Happy Birthday to you! I’m not looking for excuses for frantic parties, but your birthday is the perfect opportunity. We love you, happy birthday! Happy Birthday to a sensitive heart hidden in a beautiful person! Our love is yours to keep! We might not love you more today than yesterday, but God knows we want to party more! Happy Birthday, yeah!!! 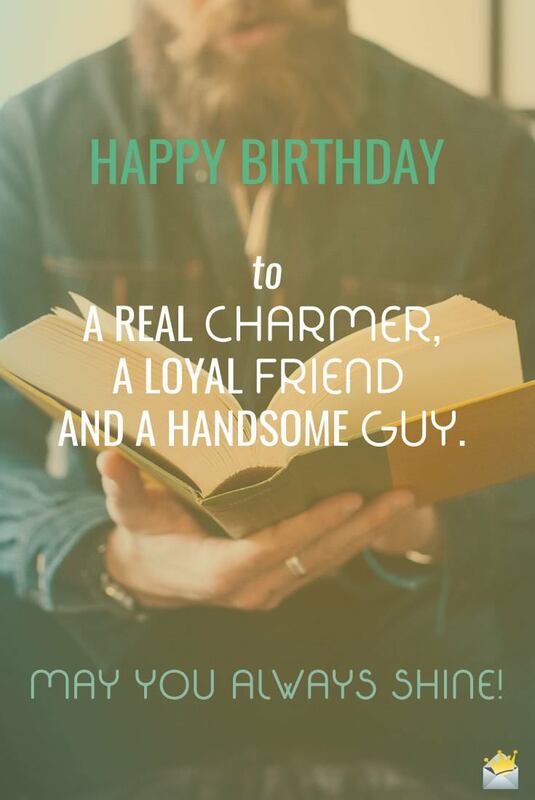 Happy Birthday to a real charmer, a loyal friend and a handsome guy. May you always shine! Being a beautiful youngster is a natural privilege. Being such an attractive adult is a rare accomplishment. Well done & happy birthday! Happy Birthday! May your days be full of laughter, love, inner joy, some luck and some extra money – not necessarily in that order! You have taught me that every day is a gift to us so that we can enjoy life. However, today it must be the day of maximum joy! Happy Birthday! Mirror, mirror on the wall, who’s the fairest of them all – apart from my friend, who is a living piece of art? Happy Birthday, darling! Today’s anniversary of the birth of a living masterpiece is wrongfully omitted throughout the entire internet (but WE know!). Happy Birthday! True friends are hard to find, so when you find them, you should wish you kept them forever. That’s what I did! Happy Birthday, I’m so lucky to have you as a friend. Birthday: the real-life show that has been on so many years, starring friends, family & loved ones. The success continues, reserve now & happy birthday to you, too! Status: Yearly cycle from birth, complete. Again. Happy Birthday! Happy Birthday, handsome! I believe you’re sexier than ever. The day you were born they called it a miracle. For us, your loved ones, it was meant to be this great luck of living with you & caring for you. Happy Birthday!